You are now reading "Rebates in Medicare Part D"
In a new Special Communication published in JAMA Internal Medicine, Dr. Stacie Dusetzina of UNC, Dr. Rena Conti of the University of Chicago, and Nancy Yu and Dr. Peter Bach of the Drug Pricing Lab explore the role of prescription drug rebates in Medicare’s Part D benefit. The authors investigate the impact of rebates on patients’ out of pocket costs as well as federal spending. 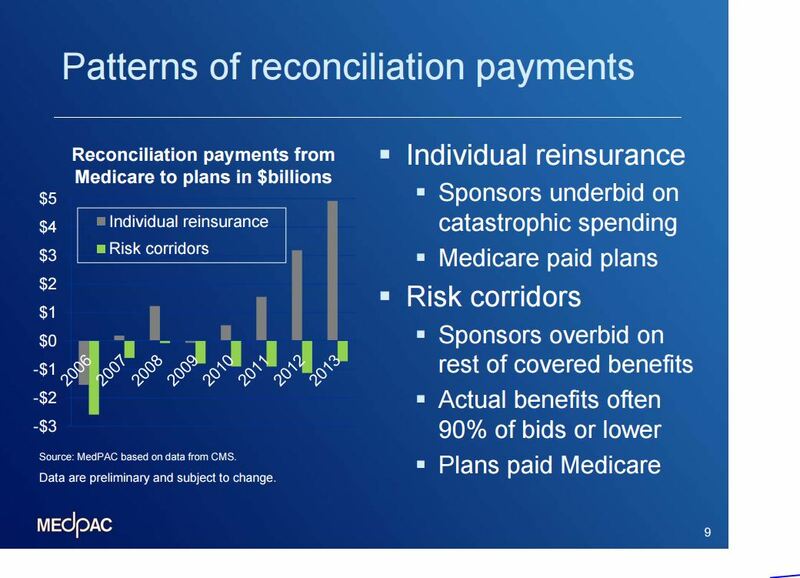 They find that due to the structure of the Part D benefit design, rebates actually increase patients’ out of pocket costs while also shifting spending from plan sponsors and manufacturers to Medicare. Two options for reform are proposed: the adjustment of cost sharing for patients’ out-of-pocket costs and the removal of incentives for plans to move rapidly through the Part D benefit. 1) Aren’t there many types of rebates and discounts in the drug supply and payment chain? Is your paper relevant to all of them? The terms “rebates” and “discounts” can in fact refer to a wide variety of different types of payments between different parties in the drug supply and payment chain. But we focus specifically on the rebates that manufacturers pay back to plans (and the PBM’s that work on behalf of the plans) in exchange for contract terms regarding those manufacturers products. We focus on these types of rebates because they cause a gap between the drug’s price at the pharmacy and the drug’s price for the plan. In our paper we refer to these two prices as the ‘list price’ and the ‘net price’ (the one after the rebate is subtracted from the list price). 2) What are the consequences of the gap between a drug’s list price and its net price on Medicare patients? Under the standard benefit the patient pays a percentage of the drug’s price: 100% in the deductible, 25% in the initial coverage period, 50% in the coverage gap, 5% with no upper limit in catastrophic. When these percentages are based on a drug’s list price instead of the net price of the drug (which incorporates the rebate the manufacturer pays to the plan), these percentage based payments are larger. We show the impact comparing two Hepatitis C drug’s (Gilead’s Harvoni and Merck’s Zepatier), one that achieves a lower price than list through a rebate, the other than has a lower list price to begin with, and how patients in Medicare bear a much higher share of the price for the first one because of this. For a typical patient a course of treatment will cost around $2,000 more out of pocket for Gilead’s treatment. 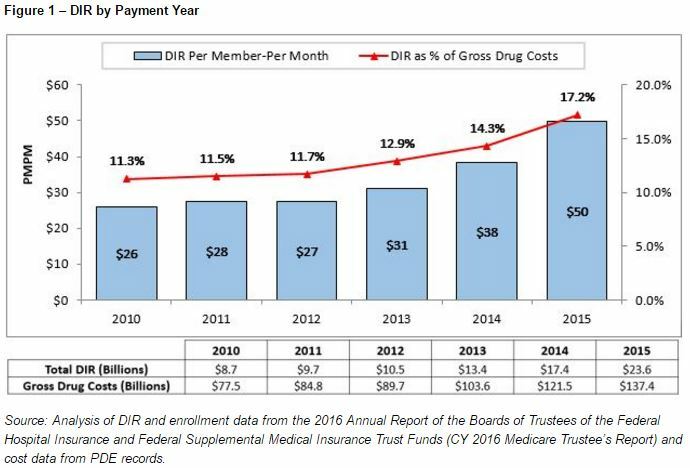 In January 2017 CMS released a report in which it outlined the impact on beneficiaries of rising drug list prices on beneficiary payments. 3) What are the consequences of the gap between a drug’s list price and its net price on Medicare program spending? 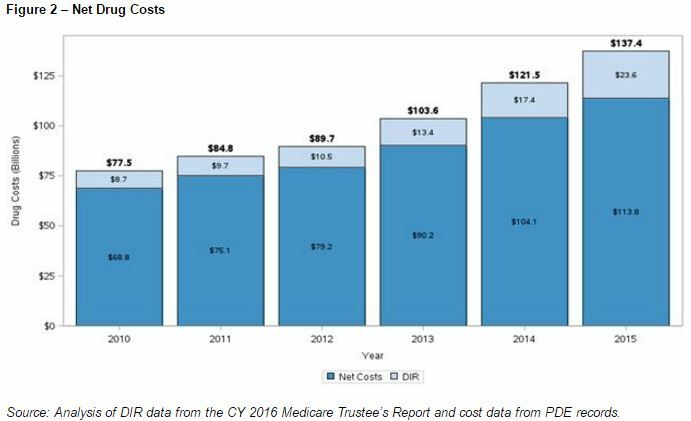 Under the standard benefit and throughout the Medicare Part D program the structure of the benefit over the course of the year changes in relation to how much the Medicare patient has spent over that year. The general structure is that as the beneficiary spends money out of pocket for prescription drugs the plan picks up most of the cost early in the year, but Medicare through reinsurance picks up more of the cost later in the year. Because the amount the patient spends is related to a drug’s list price rather than its net price after rebates, higher list prices ‘push’ the patient through the benefit earlier thus shifting costs more onto Medicare, and less onto the Part D plan. 4) Does the shift from higher list prices towards Medicare reinsurance really increase costs to Medicare? Isn’t there a counterbalancing effect of lowering plan costs that lower the premiums Medicare pays? 5) How does the shift towards Medicare reinsurance that is caused by higher list prices and larger rebates affect manufacturers? Does it matter to them? Manufacturers of branded specialty drugs provide a 50% discount on those products for the portion that is dispensed in the coverage gap part of the benefit (also called the ‘donut hole’). In our paper we note that a drug having a higher list price exceeding a few thousand dollars will actually have less of a share of its fill dispensed in the coverage gap, meaning the manufacturer discounts less of that fill even after rebates. Ours is the first report we know of that highlights this manufacturer benefit of having higher list prices and larger rebates achieving the same net price when drugs are several thousand dollars or more for a prescription. 6) You can see how this works in this interactive rebate calculator, which allows you to set up a list price and then enter a rebate amount that the manufacturer will pay the plan. It shows two different scenarios, one where the rebate is incorporated into the drug’s price for the Medicare beneficiary (what is called point of sale rebates), the other with the plan keeping the rebate and the patient paying the list price (how Part D in nearly all cases currently works). This calculator is a stylized illustration that assumes the plan bid was based on the list and net price of the drug being the same, so that the impact of a widening gap between the two can be seen, so the risk corridor reconciliation works off the net price baseline. 7) So mathematically having higher list prices and larger rebates shifts costs from Part D plans to Medicare reinsurance, but is there any evidence this is happening in any systematic way in Part D? Or is this just a theoretical exercise? All of the trends in Part D are consistent with a recurring pattern in which increasing list prices and widening rebates are delivering extra profits to plans at the expense of Medicare patients and the Medicare program. iv. 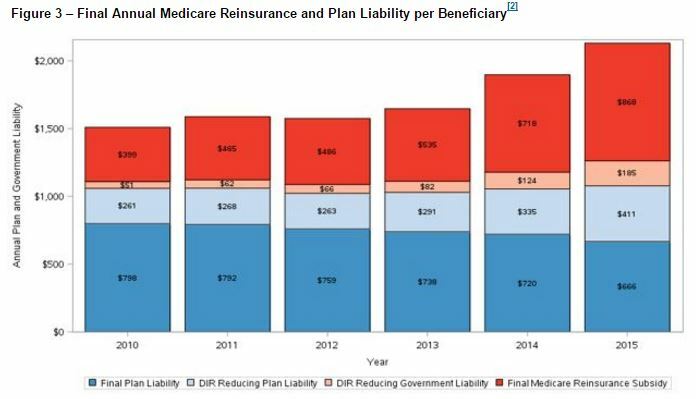 CMS showed the shift in liability in Part D in their January 2017 report away from plans and on to Medicare reinsurance. v. Here are the raw data on each plan and how much it returned (or not) in excess profits compared to how much extra it collected in reinsurance (if any). 8) Is there evidence in Part D data that rebate levels are rising for specialty branded drugs in a manner that increase Plan and manufacturer profits at the expense of Medicare and Medicare patients? as are net drug costs, although not as quickly, hence a widening rebate margin that drives the shift towards Medicare reinsurance. This pattern of rising list prices and rebate percentages which has led to list prices rising faster than net prices has also been highlighted by industry analysts. Neither academics nor CMS have the data that would be needed to answer this question directly. CMS has transaction level data from plans for each filled prescription, but the prices in those data are the same the patient pays. CMS has information on plan rebates, but that is aggregated to the level of the plan, not the individual drug and patient. The characteristics of these data are explained here on page 2. 9) What policy solutions do you propose? In our paper we propose that the copayment structure of Part D be stabilized to reduce the shift towards Medicare reinsurance. One solution is called point-of-sale rebates, where the cost of a drug for the patient would be calculated based on the drug price inclusive of the rebate paid by the manufacturer to the Part D plan. CMS currently allows this structure but it is rarely used. 10) Doesn’t the law that created Part D require that plans incorporate rebates and discounts into a drug’s price for beneficiaries? Not really. 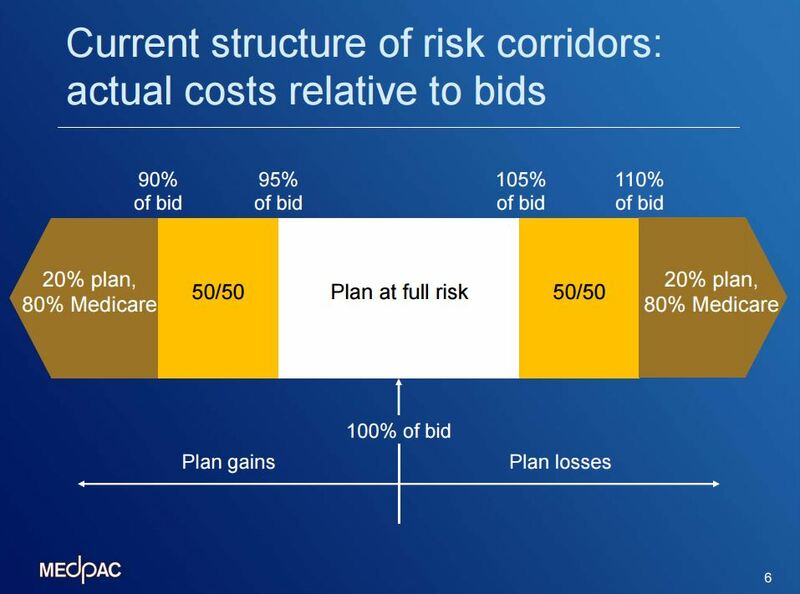 The Medicare Modernization Act of 2003 created Part D and requires that Part D plans must provide their enrollees access to “negotiated prices”. But “negotiated price” is a technical term, and it refers to the amount the plan agrees to pay the pharmacy (including dispensing fee) for dispensing a drug to an enrollee. The central tenet of our paper is that beneficiaries are paying more out of pocket than they should because these ‘negotiated prices’ are higher than the prices net of rebates. This is true even though the statute says that “negotiated prices shall take into account negotiated price concessions, such as discounts, direct or indirect subsidies, rebates, and direct or indirect remunerations, for covered part D drugs, and include any dispensing fees for such drugs.” CMS’ reading of the phrase “shall take into account” explains why Part D plans do not need to incorporate rebates into negotiated prices, although that reading does not prevent them from doing so. In 2014, CMS stated that while “we expected these … price concessions [included in negotiated prices] to be in the form of rebates offered by prescription drug manufacturers,” in fact virtually all concessions included in negotiated prices were provided by pharmacies. Accordingly, effective Jan.1, 2016, CMS amended the definition of negotiated prices so that it no longer requires reducing these prices by discounts that the Part D plan has “elected to pass through” to enrollees. Instead, negotiated prices must be reduced by price concessions from network pharmacies, unless they can’t be reasonably determined at the point of sale. In making this amendment, CMS insisted that, unless price concessions from pharmacies are included negotiated prices, the true cost of drugs is not transparent to the market and consumers cannot efficiently minimize their cost sharing and select the lowest cost drug/pharmacy combination. This “thwarts the very price competition that the Congress intended with respect to how private plans would compete with other plans on both premiums and negotiated prices.” This logic could be applied to manufacturer rebates, but CMS has not done so. Limits on Medicare’s ability to control rising spending on cancer drugs.